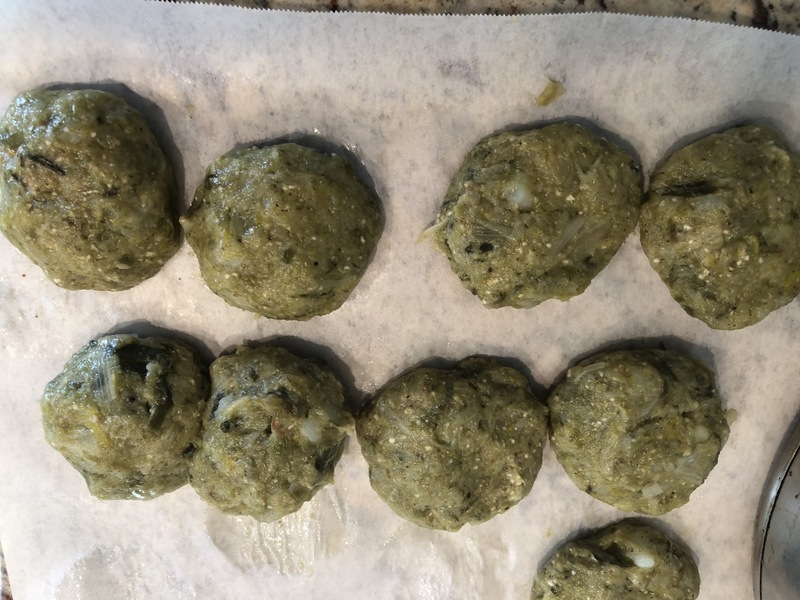 Passover 2019 Keftes de Prassa and a little music….. While listening today, I was remembering the Birkat Amazon as I had learned it in Seattle, “Ya Komimos.” Thanks to my Facebook friend Louise Chiprut Berman, I immediately had the words at my fingertips. I could hear most of it in my memory, missing a line or two. Asking on Facebook, Bryan Kirschen was able to post Hazan Isaac Azose singing it exactly as I remembered! AH, such happy memories…..and the wonders of Facebook! Cooking with my Mom. 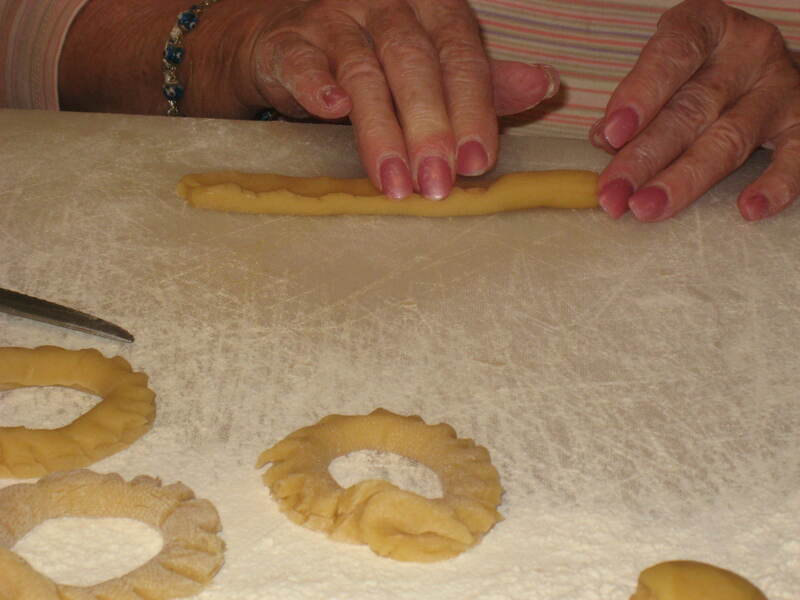 Making Keftes de Prassa….a family favorite. We serve Prassa (leek patties) at Pesah as they are a spring vegetable. We also serve them at Rosh Hashanah as part of the ‘yehi ratzonis’ – the Rosh Hashanah Seder. This is my mom’s method for Keftes de Prassa. 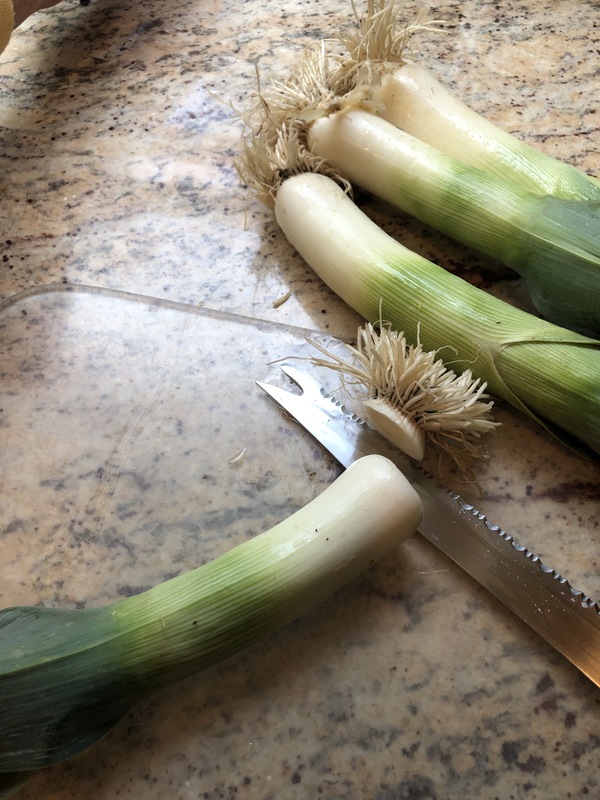 Prepare leeks. Cut 1/4″ from top and bottom. Soak and clean leeks throughly. 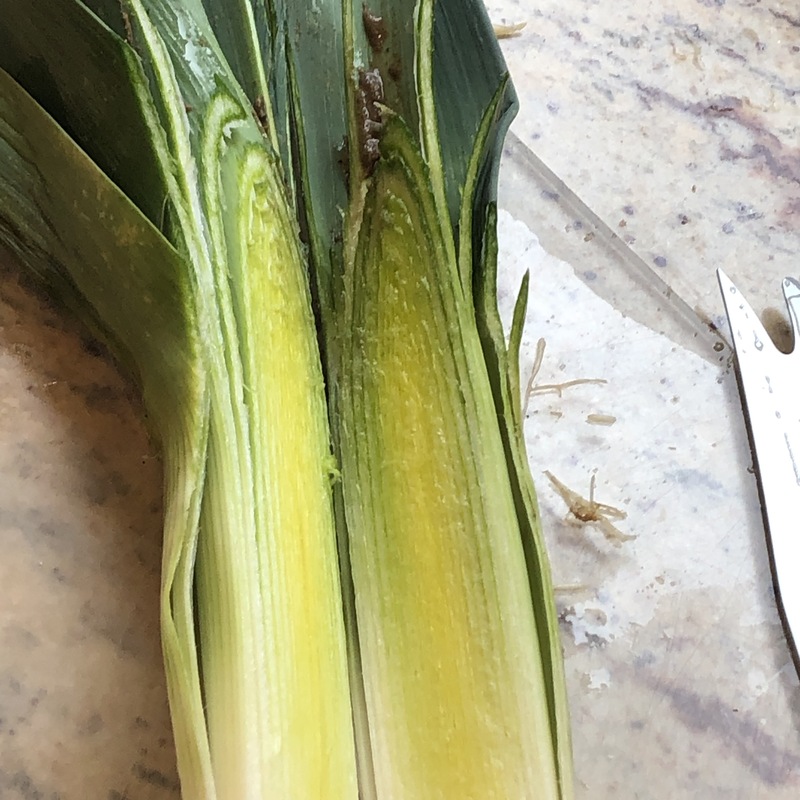 (leeks, by nature, often have a good amount of fine dirt between leaves. Make sure to clean carefully) Soak, rinse, soak again (2 – 3 times). Boil cut leek and chopped onion in a pot of water ( covering mixture), until vegetables are soft and limp. Boil Potato separately until soft. Drain (squeeze out) all liquid. Add additional ingredients. Blend into an even leek-onion-potato mixture. Shape into patties. Fry on medium heat until both sides are slightly browned. Drain on a paper towel. Divine freshly made…..can be frozen, sealed tight. Defrost and place on a cookie sheet and warm in the oven at 300 degrees for about 10 minutes, or until warmed throughly. A favorite for Pesah….delightful as a pareve dessert during the year! 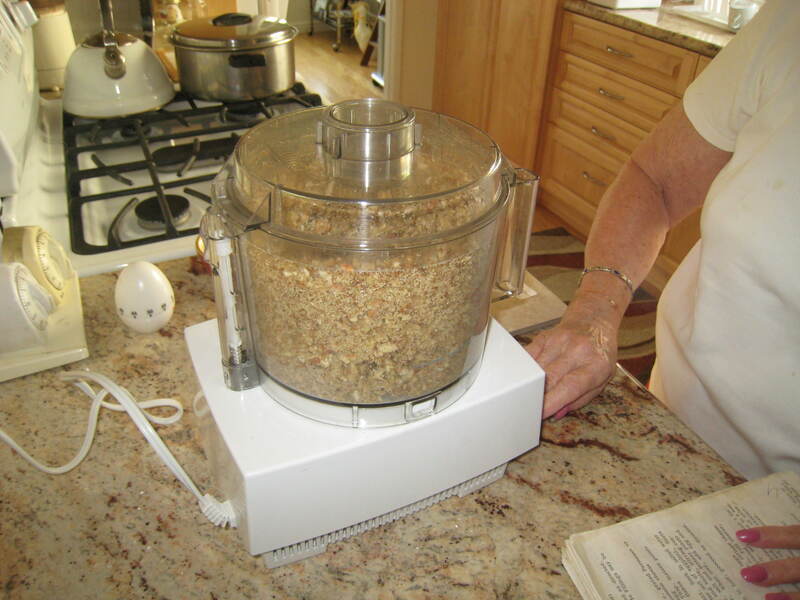 Grind blanched almonds to near a fine consistency. Mix in a bowl with sugar. Add egg whites to almonds and sugar. Mix until biscuit-dough consistency. 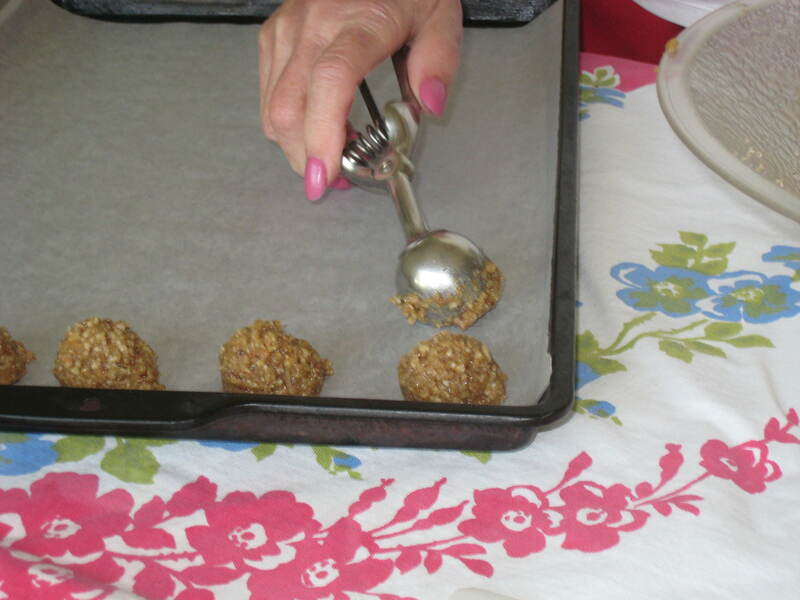 Using a tablespoon or metal scoop, drop 1″ apart on cookie sheet lined with parchment paper. Bake for 10 minutes in a pre-heated 350 degree oven. Allow to cool completely before handling. Will harden as they cool. Hanukkah celebrates the re-dedication of the Temple in Jerusalem after the Jewsih victory over the Greeks in 165 BCE. A favorite story is the Miracle of the Oil. The Jews went to reclaim and restore the Temple in Jerusalem after it had been defiled and left in ruins by the Greeks. There was only enough oil left to rekindle the candelabra that was to burn throughout the night each and every night. It would be several days before more oil be be procured and prepared. By virtue of a Miracle, the oil burned for 8 days and nights, until more oil was available. 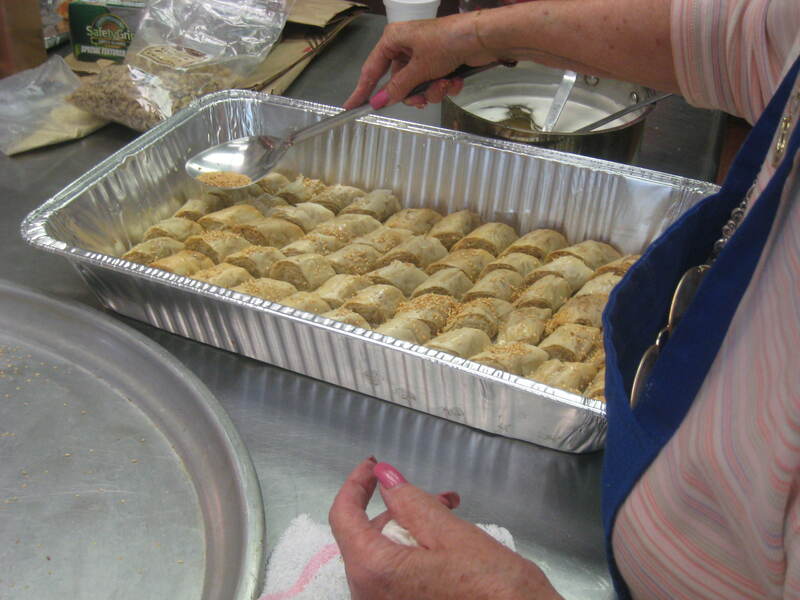 To commemorate the Miracle, we prepare foods cooked in oil for the holiday of Hanukkah. Favorites are latkes (potato pancakes), sufganiyot (filled donuts), and in our family, burmuelos (fried dough). Growing up, I had never had latkes. Our Hannukah treat was always burmuelos – light, fried dough pillows bathed in a light, sweet syrup that is absolutely devine! Made from a yeast dough, it takes some time for the dough to rise and be ready to fry. My mom will make the dough ahead of time and after dinner, drop the dough by spoonfuls into hot oil, watch them puff and turn a golden brown as she prepares the honey syrup. Once the burmuelos are ready, she will bathe them in syrup and we’ll eat them, warm and fresh! Divine, indeed! Below is the recipe. Give them a try…..and enjoy! compiled by the Sisterhood of Congregation Or Ve Shalom in Atlanta, GA. Soften yeast in 1/2 cup warm water. In mixing bowl add dry ingredients. Add yeast mixture, egg and remaining warm water. MIx well. Allow to rise in covered bowl in warm place for 2 hours. Fill a quart pot with 3 inches of cooking oil. Allow to get very hot. Drop a teaspoon of soft dough into the hot oil. Remove with slotted spoon when golden brown. Bathe in syrup. Boil together until sticky. Pour over burmuelos. Tomorrow is a cooking day…..and tomorrow night marks the first night of Passover – the first Seder. We’re all busy preparing our homes, shopping, and preparing for the holiday. I thank you for allowing me to share one last message before we begin the Festival. This is a time for gathering together. We read the Haggadah and tell the story of our delivery as a people from slavery in Egypt to freedom in the land of Israel. It is a cornerstone of our being a people. So central is the journey from slavery to freedom, from oppression to self-reliance, that we retell this story each year. We can only appreciate our freedom if we remember our enslavement. We can only appreciate our wholeness of we remember our brokenness. We can only appreciate our own land of Israel, a home for all the Jewish people, if we recall our desperation and desolation when we had nowhere else to turn. So – we tell the story, year after year, from generation to generation. And with the telling, we serve our favorite foods. Again, passing from one generation to the next our savory dishes, favorite recipes, each with a special name, with special textures and flavors and all with their own memories. These are the stories – and the foods, that bind us together as a people and keep us connected as a family. How very strong is the bond that stories – and food – provides! Our family Passover seder this year will bring together a big group – mashala!- all somehow connected to my grandparents, of blessed memory, Isaac (Hacco) Hasson and Sarota Benveniste Hasson. Both were born on the Island of Rhodes (at the time part of the Ottoman empire, Turkey), at the end of the 19th century. Could they ever had imagined that over a hundred years later, their children, grandchildren, down to their great great great grandchildren would still be connected, gathering together (in person and via Facebook) to remember their names, remember their stories, and together carry on the traditions that they, too, brought forth from the generations before them! How wonderful that is! Our Seder will include readings, stories and songs in English, Hebrew and Ladino, the Judeo-Spanish of our Sephardic family. The foods will be leaven free with flavors and names related to our Turkish, Spanish, Mediterranean roots. We hope the recipes, stories and links we’ve shared with each other help to entice, and enrich our experiences and strengthen our bonds. May you enjoy your time together with family and friends; may you tell the story of our people and the lessons of our journey. May you tell stories and remember those of our families who are no longer with us physically, so their memories stay alive in our hearts and those of our children and their lives continue to bless us. May we keep the traditions of our ancestors and create new ones with our children. May our gatherings bring blessings – and may our hands, the hands that prepare these foods that nourish our souls and keep our traditions alive, always be blessed. After a whirlwind trip to New York for a very special wedding, I returned home and got into ‘Pesah Prep’ mode. When I walked into my mom’s home on Sunday morning, she had already prepared and fried 6 dozen Keftes de Prassa!! She knows they are a favorite for so many in our family and she wanted to make sure she had them made and ready for the family to enjoy!! We serve Prassa (leeks) at Pesah as they are a spring vegetable. We also serve them at Rosh Hashanah as part of the ‘yehi ratzonis’ – the Rosh Hashanah Seder. 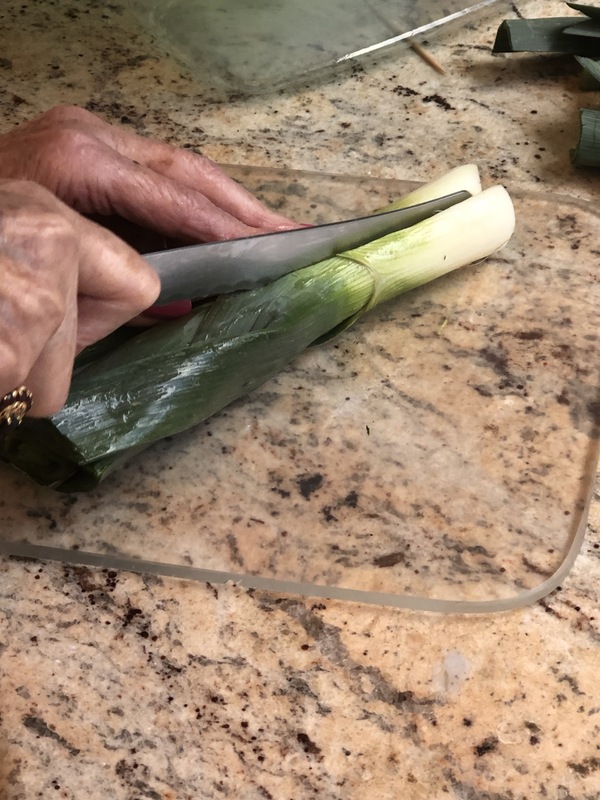 Prepare leeks. Cut 1/4″ from top and bottom. Cut in half vertically. Soak and clean leeks throughly. 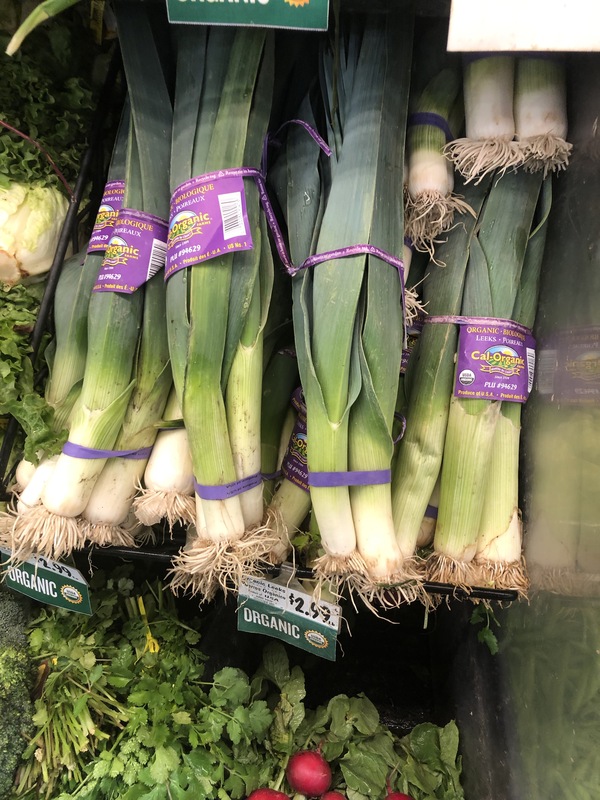 (leeks, by nature, often have a good amount of fine dirt between leaves. Make sure to clean carefully) Cut into 1/2″ pieces. Boil cut leek and chopped onion in a pot of water ( covering mixture), until vegetables are soft and limp. Drain ( squeeze out) all liquid. Add additional ingredients. Blend into an even leek-onion mixture. Shape into patties. One of our family favorites is Sevollas Reinados, stuffed onions. Savory and delicious, with a simple substitution, it can be Pesah friendly, and always appreciated as part of a holiday meal. These are made with ground beef (although I prepare it with ground chicken which makes it a bit lighter, and my family prefers the taste.) Another item that can be made ahead and frozen. Give it a try and let us know what you think! Cut onions in half lengthwise. Combine ground beef, egg, parsley, and chopped onion (from inner core saved when separating sections.) (You knew we’d use them sonewhere!). Add matzah meal. Dip meat side into matzah flour or matzah meal then into beaten egg before placing into frying pan with heated oil to brown. After browning, place meat side up in casserole pan in which bottom has been covered with remaining sliced and chopped onions. Cover with sauce made of tomato sauce, water and a tsp of sugar. Cover casserole and bake in oven at 300 degrees for 1 hour. So many dishes to prepare for the week! My mom has already started! There is megina (Meat and matzah quajado), a delicious new chicken to try from Rachel Sheff (SEC Food Group on Facebook ) Keftes de prassa (Leek patties), Bamya (okra), my cousin Sarita will make our family’s Haroset – then there’s the desserts – marochinos (almond macaroons), mustachudos (nut confections), ashuplados (meringue clouds)…… wow! Some of the best memories are made while preparing and cooking for the holidays. Spend time with your families. Remember and reflect on holidays past – tell stories; remember relatives. L’dor v’dor. This is how we keep traditions fresh – how we keep memories alive. Which reminds me – watch the movie ‘Coco,’ the new Pixar/Disney film. Beautiful lessons on family, traditions, memory. Nice to share other’s cultural traditions – nice to know the similarities we share – the importance of family and memory. Beautiful film. Perfect season to share it. Busy time in the kitchen. We’ll share more in the days to come. Looking forward to hearing of your menus, your traditions and your memories. May your hands always be blessed! 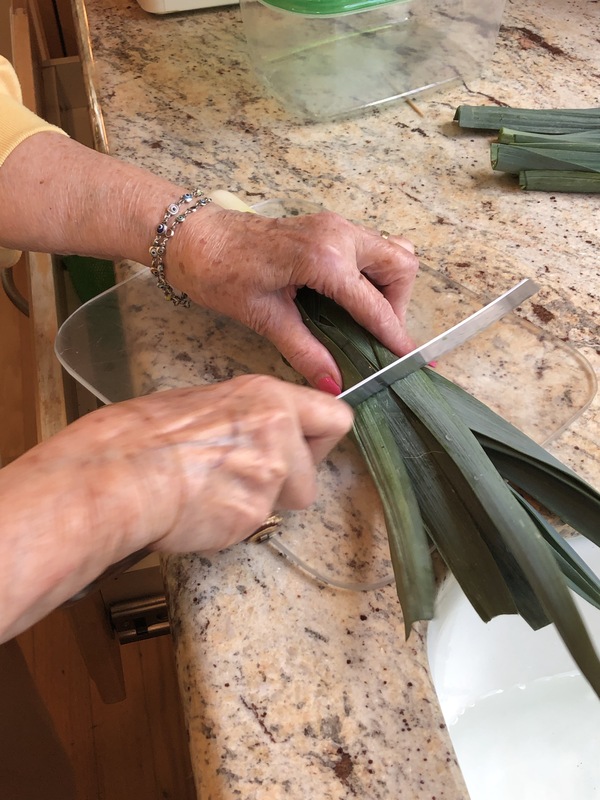 A Sephardic Shabbat, Delicious Desserts and a Story……. Have you ever experienced being transported to a different place when you hear a specific song or a specific kind of music? Maybe you remember who you were with or where you were when you hear a old favorite. Or a song can remind you of a feeling you had or an experience you were going through when you heard it and it had touched you. There is memory in music. Music can, and often does, have a transformative effect on us. All types and kinds of music. I think this is one of the reasons that Sacred Music, Liturgical Music is so meaningful to so many. It touches our soul. It reminds us of times shared with our families when we were young – it reminds of places we might have grown up in that we now miss. It brings up a longing. Sometimes it touches a places in our ethnic soul that we don’t even realize. A place within us that we might not even remember. But our soul remembers. That is the magic of music. So it was on Friday evening, January 5, 2018 when Cantor Jackie Rafii brought Asher Shasho Levy, Jamie Papish and Rabbi Jay Shasho Levy to share the bimah with her for a Shabbat Service in the Sephardic tradition. The melodies, the chanting, the sounds absolutely touched my soul and transported me to an altogether different place and time. I was entranced and enriched. And from the reactions of those around me, the majority of others felt the same. A spiritual awakening of the senses. If you go to this link: STS Live Stream Services and SELECT the Friday Night Shabbat Service 01/05/2018 you can hear the beautiful music of Cantor Jackie Rafii, Asher Shasho Levy, Jamie Papish and Rabbi Jay Shasho Levy. It was truly something special. (I’m listening as I type….aman, aman! It’s a treat!) Shomrei Torah Synagogue is blessed to have Cantor Jackie Rafii join Rabbi Richard Camras Camras and Cantor Ron Snow, all who are willing to share their bimah and always enhance our meaningful community experiences. “Being Sephardic…..at the youngest age, who knew any different? The language of our grandparents, our parents and the community was Ladino, a Judeo-Spanish that had been part of our family since living in Spain, through the expulsion in 1492, moving to the Ottoman lands, my family, as I said, to Rhodes, ….Turkish when my grandparents left, then Italian….now Greek. The Spanish became intertwined with phrases in Turkish, Hebrew and Arabic. Ours was a strong Jewish tradition – a proud tradition. It wasn’t until I started school that I really understood that not everyone who was Jewish shared the same Jewish tradition as we did. In fact…..once I left the confines of the family, it seemed that ‘most’ of the Jews that I met ‘out there’ shared a Jewish tradition that was quite different than ours. Growing up, it was a rare occasion when my parents and I would visit a delicatessen in Leimert Park, Newman’s, and have a bagel with lox and cream cheese. “Exotic.” I was an adult before I indulged in the ‘delicacies’ of gefilte fish, kugel or bobka! The Ashkenazi world out there….a whole different ball game. But it was the dominant expression of what was Jewish in America. As a youngster, it was hard to know exactly where to fit in. We weren’t Yiddish, bagel and latke Jews. And although our families spoke Ladino, we didn’t fit the LATINO profile. The 1970’s were a time of Ethnic Pride. On college campuses all over the country, people were finding their roots….Black Power, Pan African Studies, Mexican-American History…..even Jewish Studies found its way onto campuses. And onto the scene came the American Sephardi Federation, a grassroots, groundbreaking, amalgamation of distinct, unique, Jewish, cultural communities that traced their recent roots to the Mediterranean and Levant. The Sephardim. Finally……a place I fit in!!!!! In 1973 we brought together the first group of young people from across the country….from communities representing Rhodes, Turkey, Greece, Morocco, Syria, Iraq, Iran, India…..all under the banner of the ASF. We met locally, nationally, internationally. They were Us. How fun it was to gather in Atlanta, Georgia at that first Convention and meet other young people…..from New York, Atlanta, Chicago, Seattle. Maybe different regional accents….but they knew about boyos and burekas, too! …. wow! Then we met others…..who prayed with the same Hebrew accent as we did, same melodies…..but they didn’t speak Ladino. They spoke a Judeo-Arabic. But some of the words and phrases were similar or the same. Their families were from Morocco, Syria. Then there were the Iraqis….some who had gone to Iran, some to Bombay. Their language was all together different….but we all prayed the same. Together….we had things in common. Our world views, not totally….but more similar. Our foods, more similar. We came back to our homes and our cultural pride exploded. We began planning and executing programs all over the city. The Jews of Rhodes. The Jews of Morocco. The Jews of Syria. Each had a night of their cultural history, music and foods. Young adults came out of the woodwork to claim their place in their story. The general Sephardic community followed suit. It was a great cultural awakening. We held conventions up and down the coasts, groups flying from Los Angeles to Seattle. The next year we had 500 teens from across the country fly to Los Angeles to express their Sephardic pride. Around this time, one of the local Rabbis wanted to meet with me. I finally made some time and was excited to tell him about all our successes in gathering so many young people to celebrate their cultural heritage. ‘But what about classes on Torah, and classes about Shabbat?,’ He asked. ‘No, you don’t understand,’ I told him. ‘They’re not coming for that. They’re coming to connect to their cultural heritage. To find where THEY fit in to the Jewish story. They want boyos and borekas from Rhodes. They want the sights and sounds of Aleppo. The flavors of Fez. You don’t understand, Rabbi.’ ‘No,’ he said. ‘YOU don’t understand. You can’t be Sephardic if you’re not Jewish ’. It took me a few years to really internalize and get his message. But I got it. And he was right. So let’s jump ahead a few years…..here we are. We’ve grown past our college years. Many of us have married. Some…..well, some, like myself, a Sephardia, married, an Ashkenazi …. (it happens) an INTERMARRIAGE! We have two boys, Askefards, we call them. The best of both traditions. But we all follow the same Torah. When it came time to look for a neighborhood synagogue, one our children could grow up in – and learn the basics of Judaism – CBK became the obvious choice for us in the West Valley. CBK morphed into STS. And it became our home. Our family has grown up here at Shomrei Torah Synagogue. And our family, while holding tight to many Sephardic traditions during holidays and life cycle events, has incorporated many new traditions that we’ve learned from our STS family and friends. We live, what we like to call, a new American Judaism…. Biscochs, Baklava, Marochinos, Mustachudos, Marochinos …. delightful treats for all! 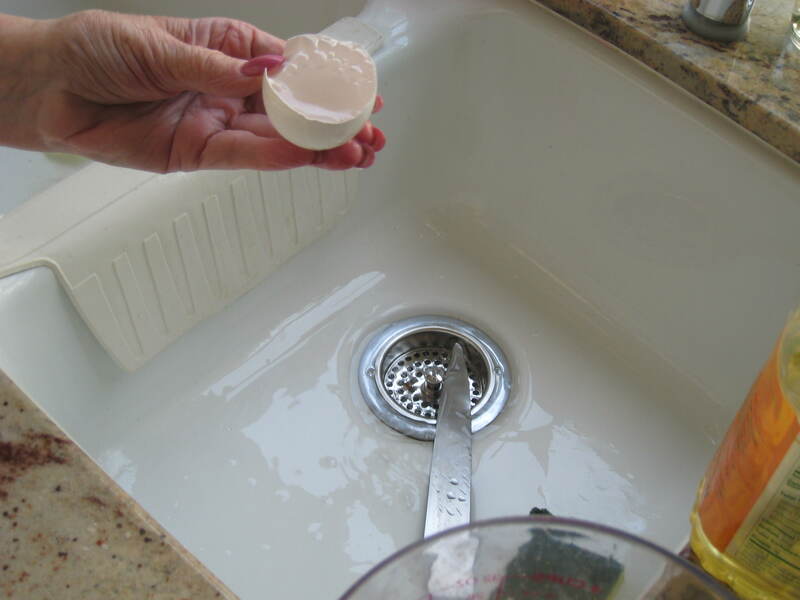 With electric mixer, beat eggs and oil in a mixing bowl. Add sugar and vanilla and continue to beat until well blended. 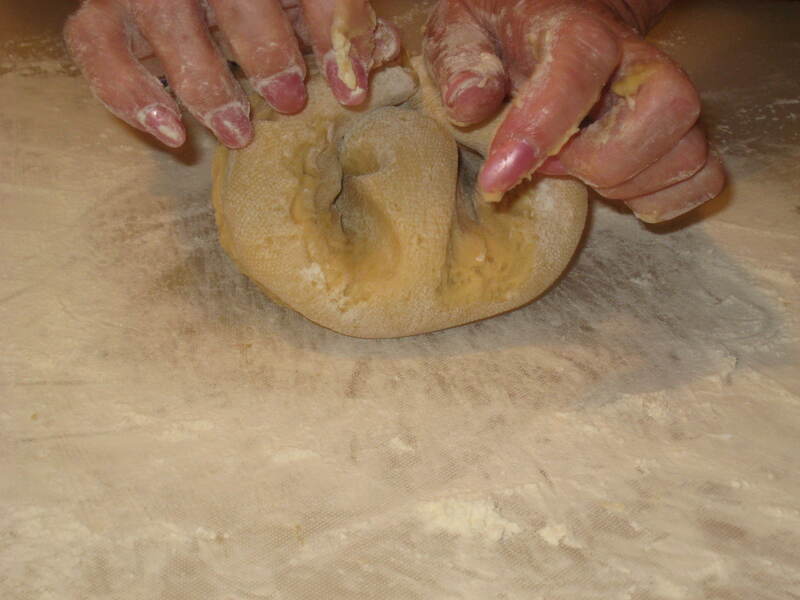 Add flour and baking powder gradually, knead into a medium dough until no longer sticky. 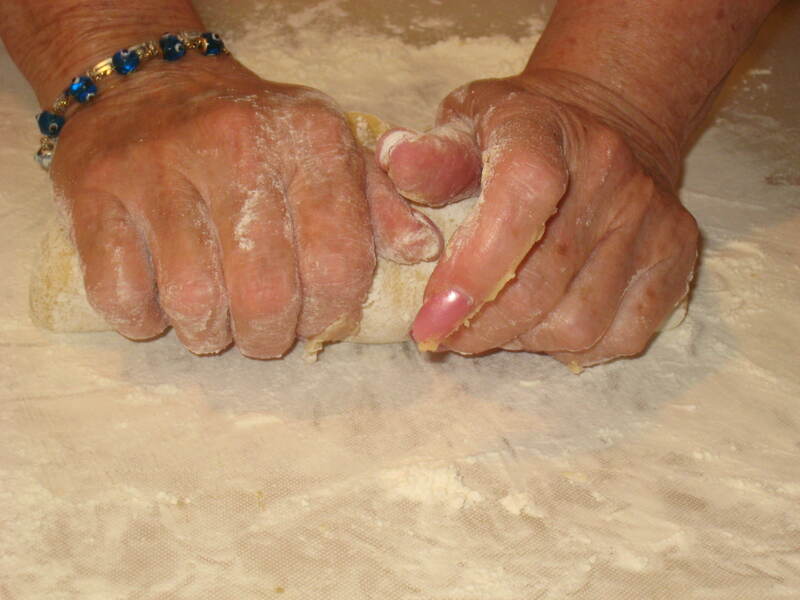 Place onto floured work area and finish kneading dough with additional flour as needed. 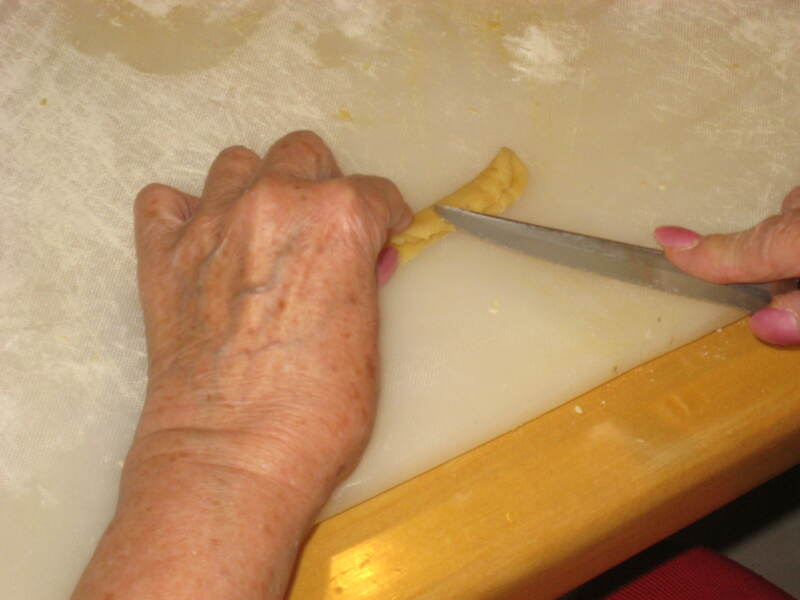 Dough should not be sticky as long as you can handle it without it sticking to your hands. Take walnut-sized pieces and roll down on table with palms of hands into a rope 5 inches long and only 1/2 inch thick. Fold rope over and cut slits into the edge. Join into a bracelet shape. Brush egg on top side. Place on cookie sheet lined with parchment paper. Bake in preheated 350 degree oven for 12 minutes or until lightly brown. Remove from pan. Allow to cool. Baklava is a sweet pastry made of layers of Filo dough filled with chopped nuts and bathed in a sweet syrup. 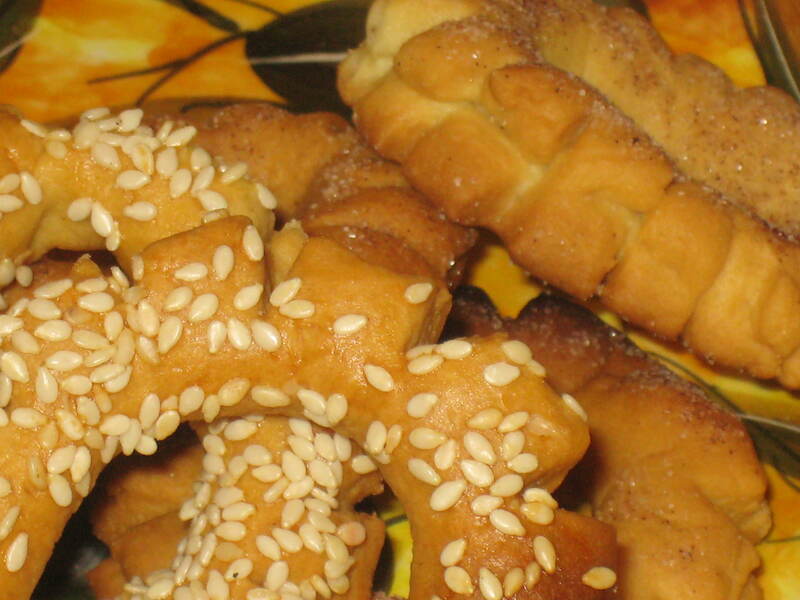 It is labeled as a Turkish, Greek or any of a variety of Middle Eastern delicacy. Our families made it on the Island of Rhodes, so we claim it as our own. 1 C oil in a small bowl. Prepare a mixture using ground nuts, sugar, cinnamon and gloves. Set aside. Open package of Filo. Keep moist and usable by placing a moist cloth over the waxed paper covered batch of Filo that you are not currently using ( otherwise, Filo has a tendency to dry out). Place one layer of Filo on your work surface. Brush with oil. Place a second layer of Filo directly on top. Brush second layer with oil. 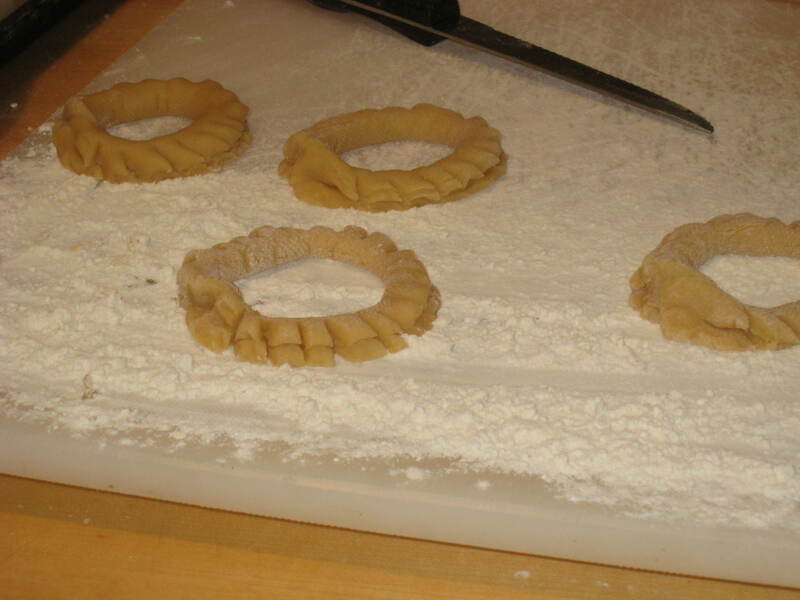 Sprinkle nut mixture in a thin, even layer on brushed Filo. Top with one additional sheet of Filo. Brush with oil. Begin to roll Filo tightly. Slice rolled Filo log at a diagonal. Cut approximately 1 inch in length. Place cut pieces on a cookie sheet, lined with parchment paper. In the meantime, prepare syrup. When syrup is ready, pour over tray of baked Baklava. Allow syrup to soak in. 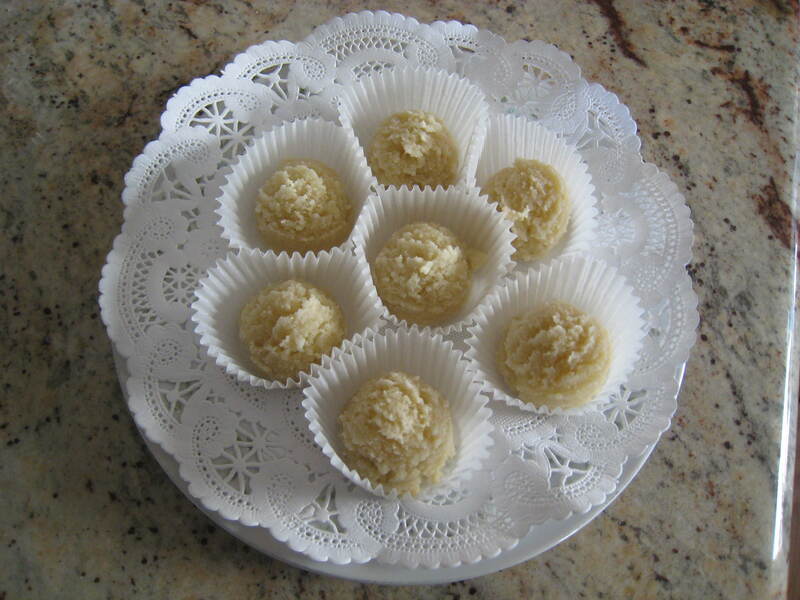 For serving, “soaked” piece of Baklava can be placed in size-to-fit paper Bake Cups (often called Cupcake liners) and placed on a serving platter. Marochinos are an almond macaroon type of cookie. They are an excellent parev dessert for any time of the year, and a favorite for Passover. Make a batch and enjoy them!! Grind blanched almonds to near a fine consistancy. Mix in a bowl with sugar. Beat egg whites and add almonds and sugar. Mix until biscuit-dough consistency. 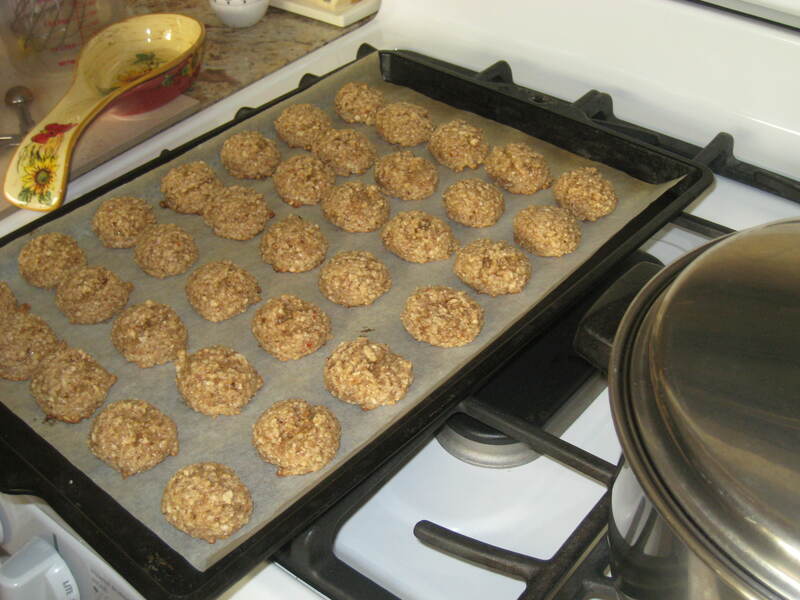 Using a tablespoon or metal scoop, drop 1″ apart on cookie sheet lined with parchment paper. Bake for 10 minutes in a pre-heated 350 degree oven. Separate eggs. Use whites ONLY. Place in a COMPLETELY dry mixing bowl. (moisture will adversely affect the creating of the meringue). Using an electric stand mixer, begin mixing the egg whites and gradually add the sugar. Continuing beating on high for approximately 20 minutes. Mixing will be done when the mixture stands in very stiff peaks. Line two baking sheets with parchment paper. ( there was a time when brown paper bags were cut and used to line these pans to ensure a very dry surface. However, parchment seems a more sanitary alternative available these days!! Spoon mounds of the meringue onto the lined cookie sheets. Ashuplados can be made as large or small as you wish. My mom used heaping tablespoons to create these clouds. We sprinkle nonpareils on top for a festive look. Before putting them in the oven, TURN HEAT DOWN to 225 degrees. Ashuplados can be made one day before serving. They are best enjoyed for a day or two after preparation. By the third or fourth day they become dry and are not as good as when first prepared. (* however, we have learned over the past few years that ashuplados freeze beautifully! Package delicately and freeze within the first day they are made). In our home, we have always used a variety of nuts in baking. (Moustachudos are the cookies that were sprinkled with powdered sugar). The cloves give them a special “kick”. These treats can be made in advance and freeze well. (Another one that can be added to your Passover collection). Shape into triangle or ball shapes about 1″ in diameter. Place on cookie sheet lined with parchment paper. Bake for 5 or 10 minutes in a 400 degree oven until lightly brown. Allow to cool and harden before removing from pan. Sprinkle with confectioners’ (powered) sugar. It was a joyfully wonderful Shabbat experience. The music was soul stirring! The Sephardic delicacies were a delight to share. Shomrei Torah Synagogue in West Hills, CA is a wonderful community. If you are ever in the area, we invite you to visit, If you live in the are, come by. We would love to have you join us. Visit us at http://www.stsonline.org. As always, Bendichas Manos. May your hands always be blessed. Enter your email address for your FREE subscription to "Bendichas Manos" and receive notifications of new posts by email.